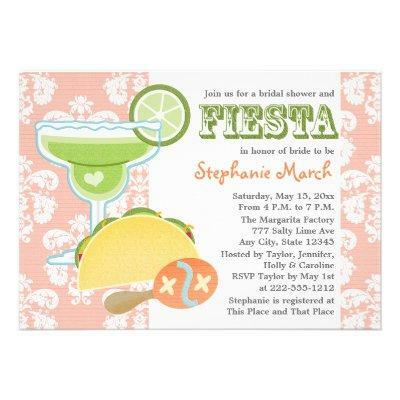 These festive and pretty fiesta bridal shower invitations with a salted margarita glass, heart, lime, taco and maraca in pink, white, green, yellow, blue and orange hues and a damask background is perfect for a fiesta or cinco de mayo themed bridal or wedding shower. Personalize the back of the invite with the bride&#;s name. Artwork &#; Chrissy H. Studios, LLC. All Rights Reserved.